It's been a lot of hard work and it's terrifying to release the game to new people, but launch day has come. We appreciate everyone who's been waiting for this, and everyone who plays the game! This means a lot to us. Why DLC? It might be weird to launch a game with DLC (or maybe it's not at this point anymore? ), but we're doing something different from most free to play games. There are NO repeat purchases in this game. We have 'gems' in the game, and you can spend them on a daily rotation of items, but you also earn gems in game by doing daily quests and getting achievements. You can buy the Advent Calendar DLC that will give you gems every day you log in FOREVER. We're more interested in you playing the game and hopefully buying a bundle because you like the game rather than aiming at getting you to spend 100$ on a gem bundle because you're tired of the artificial grind we put into the game to get you to spend money on gems. Depending on how things go, we could add more bundles, especially if there's a specific thing people would like to see get done as a bundle. What's coming? 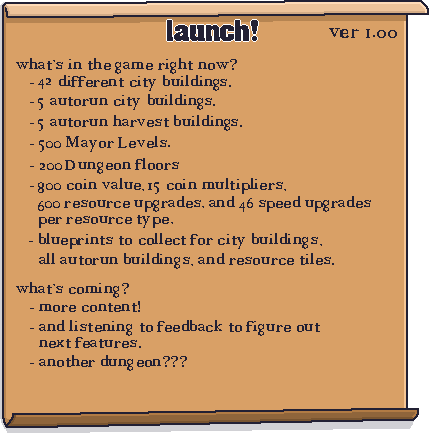 We have a list of ideas we could add to the game, and some immediate content that seems like a no-brainer (like more buildings for the city), but we also want to see what the reaction is going to be and hopefully grow from there. So let us know! Bugs? We're really, really hoping we squashed all the crash bugs, but just in case you do run into something really bad, there's an official bug thread that you can check out and let us know what happened and we'll try to fix it! A crash should give you a pop-up error message to copy-paste the error message and letting us know what you were doing when it happened would really help us out in tracking it down and fixing it. Fixed an issue where the rain sfx wouldn't turn off when rain stopped. Fixed an issue where the rain sfx wouldn't mute/unmute when you toggle the mute sfx button. Fixed an issue where there was a random crash that could happen when you click the back button in the construction menus. Random chance of a crash when buying a skillpoint from the Construction yard now fixed. Fixed an issue with a random chance of a crash happening when closing down a build resource tile. Fixed an issue with local loads not loading when a Steam Cloud Save doesn't load properly. HOPEFULLY fixed an issue with mash-clicking (or using autoclickers) would click on a tile more than it should. Fixed an issue with two songs playing when you first prestige! Fixed an issue where if you opened a building pop-up too close to the top right of the HUD you couldn't reach the X button to close it. Taking another shot at the random daily quest crash bug. Fingers EXTRA crossed that we caught it this time? Fixed a weird worker issue when you max-upgraded the time for a resource. A commendable DLC policy / sales model for a F2P. I wish you luck with the game! So far I'm enjoying it but the tempt for bundles has yet to lure me in. @Crazy that is a weird crash! Thanks for the report. I've made a ticket and hopefully we can find that one. @wxxw_ukr13 Any different languages would be a massive undertaking and I have no idea when that could happen. We have the text baked into most of the art so it would be an ordeal to figure out a system that parses different languages and draw all the new art for everything. Resolutions and full screen we're looking into. We tried before launch but the game art would distort really badly and we didn't have a fix for it in time. When the Russian language and the normal screen resolution? I had a wierd crash. @rydog256 Yup! You can keep clicking to make things go faster. Glad you're liking it! !